Last year Kotaku readers were enthralled by the daring exploits of Shinya Arino as he desperately attempted to finish a dozen of the most brutal retro games Japan has to offer. Now we're giving you one last chance to watch before Retro Game Master goes away forever. It was a grand experiment, broadcasting weekly episodes of an entire season of a Japanese television show centered around the triumph and (more often than not) tragedy of one man's quest to conquer classic video games. Dubbed and subbed for the Japanese-impaired, the show gathered a small-but-loyal following among our readers. Since the show aired last summer not an event has gone by when I haven't been asked "When is Retro Game Master coming back?" To answer that question, it's not returning, unfortunately, and now our rights to that initial twelve episodes will be up soon, so we've gathered the entire first season of Retro Game Master together for one last hurrah. So gather your friends, roast up some popping corn, and watch video games make a grown man cry. In this first episode of Retro Game Master, our hero, Shinya Arino, faces off against grueling Nintendo Entertainment System game Ninja Gaiden. In this second episode of Retro Game Master, our hero, Shinya Arino, faces off against Sega Mega Drive classic Super Fantasy Zone. In this third episode of Retro Game Master, our game-testing everyman, Shinya Arino, faces off against Bonanza Brothers. In this fourth episode of Retro Game Master, our game-testing everyman, Shinya Arino, faces off against Solomon's Key. 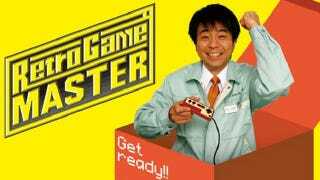 In this fifth episode of Retro Game Master, our game-testing everyman, Shinya Arino, faces off against Clock Tower. In this sixth episode of Retro Game Master, our game-testing everyman, Shinya Arino, faces off against Mighty Bomb Jack. In this seventh episode of Retro Game Master, our game-testing everyman, Shinya Arino, faces off against The Mystery of Atlantis. This week on the season finale of Retro Game Master the Kacho takes on Golden Axe. It's over. That's what people say about Japanese gaming. While there are bright spots in Japan, Western games (and gamers) now rule the roost. It's easy to forget just how great Japanese games used to be.